Don’t design a product with a part that is marked as “Not for new designs” or “Obsolete.” This seems obvious. Look at availability when picking your part. If large distributors like Mouser and Digikey have lots of units in stock, there’s a good chance that it’s a popular part that will continue to be produced, but it’s not in such high demand that they can’t keep it stocked. This is the ideal situation. The more generic the part, the more likely you’ll be able to find suitable alternatives if your primary source fails. 0603 is a super common footprint size, and you can still get 0805 or 0402 parts to work in a pinch. Use common values as well. 1% resistors are just as cheap as 5%, but if you use 10k resistors, you’ll be able to source literally a billion of them with no problems. Try 9.88k, though, and you get only a handful that are 10x the cost. Lots of conventions have emerged with common parts that make it easy to drop in replacements. The 555 timer is available with different part numbers from TI, Maxim, Microchip, Intersil, the list goes on. They all have essentially the same specs, and definitely the same pinouts and packages. The less specific your design, the easier it is to find lots of suitable components with high availability. If you want to measure current, you’ll probably use a current sense resistor. You specify a value for the resistor, a package size, and a power rating. Other than that, though, you may not care about any other specs. Make sure in your schematic that you note the critical specs so that your alternate part search goes easier. If, for example, you need a .01Ohm 2512 resistor rated for at least 1W, then you can get creative in your sourcing, and maybe discover that there is a 3W chip that’s cheaper. When you clearly define which specs matter and which don’t, you can make other parts available for sourcing that may not have been otherwise. If nobody has the part you specify in stock, you need to be able to list other parts. The previous points touch on this, but it’s worth spelling out in bold. Even during the design phase when you are picking out the parts to use, it’s important to also collect a couple other part numbers that could also work. When I’m searching, I usually filter by the features I need, then sort by price. The first few entries are my primary and alternate components. It’s usually that easy. I have a hierarchy of suppliers, and almost always my first choice has the parts I need. It’s a good practice to check your part against multiple sources, though, using tools like Parts.io. If none of your sources can reliably get a particular part you’re interested in, or they all have long lead times, that’s a sign that you should look for a different component. DON’T buy parts from sketchy sources. In a moment of desperation, you may be tempted to purchase a surprisingly cheap, seemingly identical part from eBay. These parts are fakes or factory rejects or have been damaged or exposed to humidity with rusted connections, or SOMETHING, but they will cause you more problems in the long run. It’s not worth the risk, and you have no idea what may be wrong with the parts that will bite you further down the road. A QFN package nested inside a TQFP package for more flexibility in sourcing. This happened to me, and I have the PCB to prove it. During the product development phase the Atmega328P was in short supply. I wanted to use the TQFP-32 package, but so did the rest of the developed world right then. Fortunately, some suppliers had a QFN package available, so I designed the board with the two packages nested. Since the pinout was identical, and the QFN fit nicely inside, it was easy to do, and it made the board compatible with either package. It may be necessary to design your board so that it can accommodate different components depending on which is available or which production method you use. Don’t design yourself into a corner with parts that are too niche or not readily available. Paying attention in the early design phases can save a huge hassle later. Author’s Note: Our parent company Supplyframe has some tools for choosing your parts and managing your supply chain and all that. It wasn’t until I was putting the finishing touches on this article that I remembered this, and realized I might look like a corporate shill if I didn’t at least mention it and disclose that Parts.io linked above is one of those tools. One of many sources to find alternate parts is FINDCHIPS.COM – I’ve used them almost since they started. I think http://octopart.com deserves a shout-out too. Thanks, at least they don’t shove a “Be a member for just 99$! !1!” layer in your face. I have often seen this on boards: 3 holes for through hole capacitors (both electrolyte and film), multiple footprints for crystals, and also for larger surface mount capacitors. Especially in the case of through-hole electrolyte capacitors I suspect this is not just for availability, but to reduce capacitor values until the noise on the power lines is almost enough to stop the stop working, at least for the first year. male that four holes for capacitors and a couple smd capacitor footprints between them… just in case. That was common practice around the pentium-m era where higher availability of high density smd ceramics, “solid-state” capacitors and very energy efficient chipset+cpu combos of the embedded variety. Another tip: currently the industry is experiencing one of the longest-leadtime periods in recent history, according to our distributors. I’ve seen quotes out to well over 6 months for some stuff. If you need DDR4 memory anytime before mid-2018, good luck! Fair play, that QFN inside a QFP footprint is an excellent idea. I’ve also done the same at a previous employer with opamps, having a dual footprint for through-hole and SOP packages. It allowed us to quickly switch in/out various audio opamps easily. Over the years of pretending to manufacture lots in my side business (i.e. go through the exercises of behaving like i’m building thousands), I’ve found that there are a few suppliers for various parts that I seem to go back to again and again. For instance – Yageo 1% 0603 resistors. I now specify them when ordering. Easy to source from Digikey and Mouser, and any trips I take to Shenzhen. Not only that, but they have part number barcodes on them that actually spell out the part number. Something you’d think would be obvious, but there are plenty of suppliers that don’t do that! Yea, when I was walking the markets of Shenzhen, there were hundreds of thousands of them just sitting around at various booths, stacked as high as trays could be stacked. There were enough reputable vendors selling real ones that we didn’t have to worry about getting fakes. I wish that were the case for all the other components we had to obtain. Since I’m working on an Arduino compatible solution, I’m really tempted to drop the atmega and move to a ARM cortex SAMD21 because of this issue, despite the extra development effort needed. Hey, on your landing page, your product shows IDC punchdown terminals… What did you search for to source those? I was looking for them for a project a while back but couldn’t find anything relevant. Those punch down blocks are Bel Fuse SS-51000-004. They also have a version without color codes. Lol I’m not going to buy all 5000 that exist… It was in mind for a couple small projects of mine which use CAT5 similar to your SKWARE product. Mergers in the industry may make the problem worse. Microchip’s acquisition of Atmel has produced a company with overlapping product lines and multiple fabs. It seems to be taking them a while to sort this out and achieve the economies that should come from the merger. Yes, we’ve been waiting for the “other foot to drop” when it comes to (maybe) Microchip killing-off competing ATMEL parts after the ATMEL takeover by Microchip – no matter what Microchip says. I think we may be seeing this happen now in the supply-chain. Or maybe not. The ATMEL AVR parts are very popular in Asia due to the free and open IDE, China in-particular. Microchip wants this all to themselves under their own-brand parts and crippled/expensive development tool-chains. Correction, the ATMEL IDE is not “Open”, but it is “Free” and not crippled. 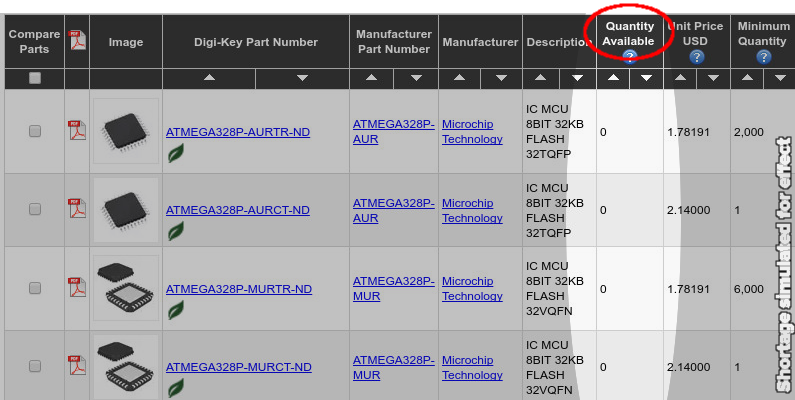 Now that Microchip owns ATMEL, we can only wonder how long that will last. There are both free and open alternatives available though. For example, the Arduino IDE is based on these alternatives. Clarification: I’m referring to Atmel Studio IDE, not a mashup of Open toolchains. I would reply to @celem directly about this, but the post thread has hit the depth limit. Thanks for the link @celem anyway. Why haven’t you used one of the AVR chips with built-in CAN support? Because of their price? I wanted a two-chip approach, so as to be able to reset the main chip from the other one in case of an issue. This also enables to offload some work from the main chip to the secondary one which focuses on can bus. I could have used an AVR but an arm cortex such as an stm32f0 is simply a cheaper and more powerful approach. There are only a few people who make 12 inch wafers, and equipment from AMAT and AE is complicated and sophisticated. Intel requires “Copy Exact” when expanding and some of the smaller fabs do to. Wafer shipments have increased at the same time wafer prices are up 20%, indicating an ongoing shortage. NAND for flash storage is the big silicon hog at the moment and getting bigger every day. Bob Baddeley: those photos certainly don’t look like ATMega328P – on top photos, the chip is 32U4 =) That said, again, great article! A problem with that QFN/QFP trick is that for the QFP, you don’t want solder paste on the QFN footprint, so you need to know what part you’ll be using when the stencil is ordered, or order 2 stencils. Or use a stencil with both, but tape up (or otherwise seal) the holes that aren’t needed. Transistors, that’s what gets me. Trying to find something close to another one that can be used as a drop in replacement with minimum change to other components. Just comparing datasheet is a nightmare. Would love to see a run down on that here! Any alternative to the st901? Current gain is impressive on that ST901T. And if Donald goes to war with North Korea, many parts go out of stock. This has happened to me with the ATmega328PB during development. Fortunately I managed to jump on and order 550 before they ceased to exist worldwide in all packages, which should see things through the storm until November…. Keep an eye on your critical parts throughout development! Just FYI, some IC designers (e.g. Silicon Labs) have extremely short product lifecycles! Even with the 555 you use as an example, you should be careful, they are not all created equal! I recently discovered that set/reset dominance is not standardised, and half the manufacturers don’t even specify it in their datasheets. If this matters in your design, check it. This nicely illustrates why you should be very careful when selecting alternative components after the initial design and testing phase, and you should always test the replacement before committing to a large producing batch! The SHA badge story was another example of this. Order extra parts, end up with unexpected behaviour due to it being fakes. Always test what you have or deal with issues sooner or later. It even pays to test supplies from reputable sources. In EEVblog #134 Dave Jones tells a story about EPROM chips that arrived preprogrammed for another customer. Correct chip, functioning and coming directly from the manufacturer, but wholly unusable. Doing an entire production run with those could be a nightmare. Great Post! I have been living this myself the past week as we go to prototype with two boards.